This webpage is transcribed from an unpublished article written in 1975. Installed on 11 March 2006. Recent research into brain functions has failed to find any trace of specific locations for specific memories. It appears that memories are somehow stored throughout the whole of the cerebral cortex frontal area or at least throughout a sizeable portion of it. Thus damage to a part of the memory area does not necessarily result in a loss of memory. The brain also appears to have a very large memory capacity that in the case of the majority of people never gets completely filled up, although there may be some exceptions to this: for example, people who are said to be in their second childhood. The memory function and its retrieval system could be considered quite baffling especially when people try to build models of it using current computer and data processing philosophies. This discussion departs from the conventional serial storage memory concept and borrows from the rapidly growing field of laser holography to present a model for memory processes. There are several points within the discussion where the reader is left to his own imagination and background to conceive of the particular mechanism that may be operating. The underlying purpose thus, is to present a framework on which to build a viable theory regarding the human memory. In laser holography one of the techniques of recording graphic information is theoretically and to a limited degree almost practically, capable of storing an infinite or at least a very large number of different pictures, all within the same photographic emulsion. The diagram on page 29, top, depicts this technique. The coherent source illuminates a scene to be recorded. Part of the coherent light travels directly to the photographic emulsion and is called the incident or reference energy. Light reflected/refracted from the objects also impinges on the emulsion. The two forms of energy, incident and reflected, interfere with one another within the emulsion and create a hologram or an interference pattern. Other scenes may also be recorded on the same emulsion without degrading each other, by moving the coherent source to different locations. The next most, or equally, fascinating aspect of this whole process is that the emulsion can be cut in half or quarters or even smaller pieces and the whole scene can still be reconstructed from the fractional part being used. True, there will be an overall degradation in the quality of the smaller version reproductions and the viewer will have to restrict his viewing angle due to the smaller size of the film, but the entire scene, as visible from the particular viewing angle will be reproduced. A means of providing rapid flashback can be had by programming the coherent light source to jump from position to position in sequence. Movies could even be made by a rapid fire recording technique where the light source would move in short increments and flashing at each stop. Now comes the biological hologram. Let us hypothesize a coherent source of biological (electrical) impulses within the brain stem that could illuminate the bodily projection areas of the cerebral cortex and the frontal "memory" area. Lets discuss the visual portion of memory first, but keep in mind that the other sensory areas can be (and must be) included once the concept is clearly grasped. Let the frontal cortex be a holographic medium for bio-electrical interference patterns. Suppose a visual pattern is registered in the occipital area (rear) of the brain. This will be represented by varying levels of electrical activity as a function of the light levels impinging on the retina. These bio-electrical pulse trains that make up the repetitive wave fronts have a parallel to the coherent wave fronts or waves of the laser. 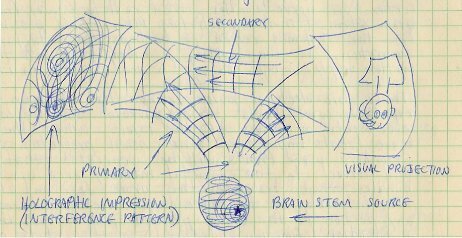 When the wave fronts impinge on the visual projection area, secondary wave fronts will be generated that will travel to the frontal memory area via fiber bundles that traverse the brain fore and aft. The intensity of the secondary wave front from any portion of the visual projection area will be a function (function undefined) of the state of electrical activity at that point. When the secondary wave front (which has the same frequency or repetition rate as the primary) reaches the frontal area, interference will occur between primary and secondary waves, and the overall interference pattern will recorded electrochemically in the frontal area. Again, the actual recording mechanism is not defined here but is left to the reader to define. laser source as in laser holography, and allows subsequent impressions to be recorded in the same medium. Probably at birth, or somewhere back there, the process starts with a given neuron firing off and the subsequent locations of the wave front source being a logical function of the brain's construction, in that region. The active source neuron pattern might be a spiral chain or some such arrangement. The construction of the stem mechanism (or wherever the pulse generator function is) would be such that whenever a memory is being reviewed, the original series of neurons would fire off in the same sequence, thus permitting "running the record" until the proper scene is recreated. The "A HA!" function could be wired in to keep the playback gain low until the desired info is found. It seems that there must be a finite limit to the number of impressions that can be stored using this model, because there would be a finite number of "source" locations within the stem. If a person lives longer than his supply of new source locations, or centers for the bio-electrical wave fronts, his brain stem may in fact reset itself to "zero" and presto, the individual is in his second childhood. True, he could do some recording over the original memories, but his recording mechanism, at [current] age will probably not be as good as when new, so the individual would live a double life, his childhood memories being superimposed on his present world impressions. His behavior and responses would most likely be directed toward the stronger of the tug-of-war contestants for his attention. This discussion does not make an attempt to define that aspect of us that seems to interpret, enjoy, or [to] act on the present and recalled impressions. Rather it addresses only the tools that are at its disposal. Read and understood by Lester B. Lekenby and Timothy B. Hogle, 17 March 1975.